Hydromassage Therapy - Chiropractor in Brunswick, GA Serving Patients in Saint Simons and Jekyll Island! Many episodes of back pain are caused by muscle strain. The large paired muscles in the low back help hold up the spine, and with an injury, the muscles can become inflamed and spasm, causing low back pain and significant stiffness. Common causes of muscle strain of the large back muscles include: a sudden movement, an awkward fall, lifting a heavy object or a sports injury. Muscle spasms in the lower back can create sensations that may range from mild discomfort to excruciating pain. A combination of heat and massage can help relieve the pain. 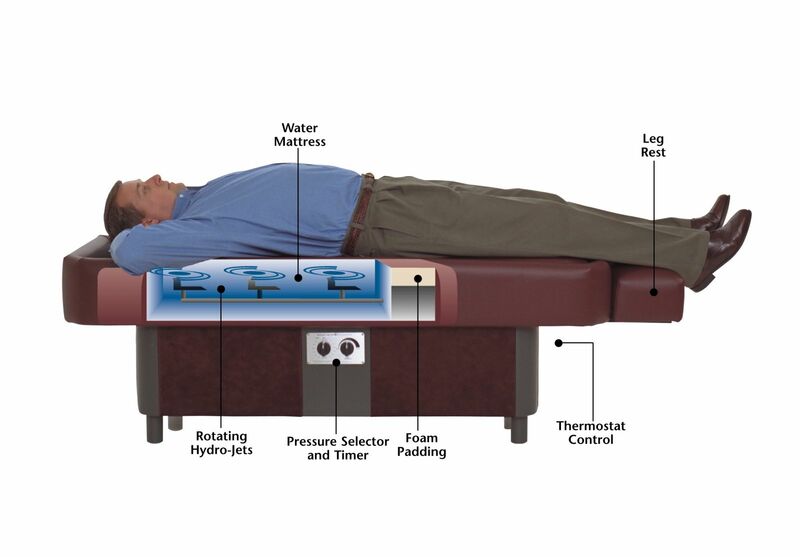 Our hydromassage table combines both therapies in a simple to use and safe device. Improves blood circulation. Heat dilates the blood vessels of the muscles surrounding the spine. This process increases the flow of oxygen and nutrients to the muscles, helping to heal the damaged tissue. Reduces Pain. Heat stimulates the sensory receptors in the skin, which means that applying heat to the back will decrease transmissions of pain signals to the brain and partially relieve the discomfort. Relaxes Muscles. Heat application facilitates stretching the soft tissues around the spine, including muscles, connective tissue, and adhesions. Consequently, there will be a decrease in stiffness as well as injury, with an increase in flexibility and overall feeling of comfort. Improved blood circulation. Massage increases blood circulation, which aids in recovery of muscle soreness from physical activity or accidents. Muscle relaxation and improved range of motion. Massage causes the muscles to relax which will improve range of motion. Increased endorphin levels. The increase of endorphin levels is actually one of the greatest benefits of massage therapy. Endorphins are the chemicals the body produces that make you feel good, which is very effective in managing chronic pain. Your Chiropractic treatments will produce better results. 10 minute session on our hydromassage table!